Bigger is Better… Fore these 70s theme costumes, we made the Afros from balloons, paper mache and pillow stuffing to make them super huge. They weren’t heavy & the guys got a lot of comments on them at the Halloween party we went to. Are there instructions on how to make the super size Afros? Those are hilarious! 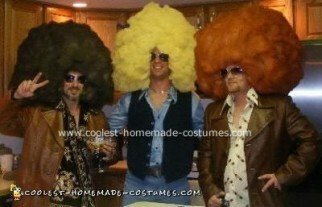 can you post instructions on how to make the afros? they are hilarious! very interesting choice I think. Please, oh, please post the instructions on how to make these wigs! This is the best thing I’ve seen in years!! These wigs are super cool – great idea! Can someone please post directions?? I have looked all over the internet for some but can’t find any (directions). The would go perfect with our Relay for Life theme and sounds as to be cheap! i have the instructions on the 70’s afro!!! let me know. Anyone figure out how to make the afro’s yet??? If anyone could post instructions I’d really appreciate it!! Thanks!! IF YOU HAVE THEM…POST THEM!! Blow up a large balloon (almost as large as you want the wig to be) and tie it closed. Apply paper mache (strips of newspaper or other paper dipped in some craft/Elmer’s type glue with a little water added to it) to the balloon, overlapping the strips. Let dry. Repeat paper mache process. Paper mache the whole balloon EXCEPT where the face goes (think motorcycle helmet shape.) Let the second application of paper mache dry. Once it is all dry, pop the balloon and remove it from the “form.” Ball up a large handful of pillow stuffing (a.k.a. Fiber Fill) and glue it (I’d use a glue gun) to the paper mache form. Add more “balls” around the form, fluffing and shaping it as you go. Add more layers if necessary. You could also use a spray glue (Elmer’s or another brand) to glue the Fiber Fill to itself to make layers. Once the glue is all dry, spray paint the wig whatever color you want it. The spray paint should act as a sort of “hairspray” and hold it all together. That should do it. This is just a guess as to how THEY did it. Feel free to tweak this as needed to make it work. If anyone has any better ideas, please submit them. Good luck! I think it’s easiest, if you glue the pillow stuff to a pillbox cap.